Fontainebleau (Bleau to the french and Font to english speakers) is the name of the large forest (about 250 square kilometers) and small town about 50 kilometers south of Paris. 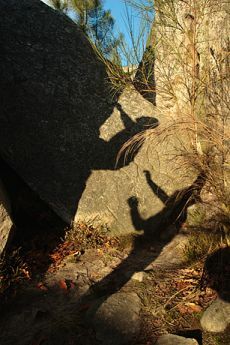 It is probably the finest bouldering area in the world. The rock is a very fine grained sandstone and there are literally tens of thousands of problems scattered amoung the forests and sandy plains. 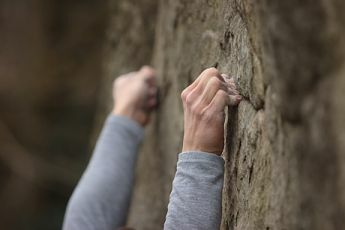 The style is very technical, the most common holds are slopers. 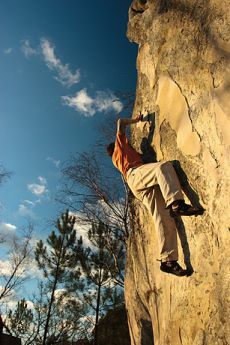 Climbing started here as a way of training for the Alps. 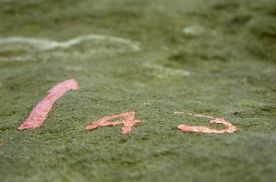 The emphasis was on doing a lot of climbing so problems where organised into circuits which are a sequence of problems of a similar difficulties marked out by small arrrows and numbers painted on the rock. From Dublin Air France and Aer Lingus fly to Charles De Gaulles. To get to Paris from Charles De Gaulles take RER B see timetable. Ryanair flies to Beauvais and is usually the cheapest however there is limited choice in car hire and if you aren't driving you have to get the Ryanair coach into Paris which takes about an hour and a half. Bringing a pad is not a problem but it may have to go in oversized luggage. From Paris, go south on highway A6 (A6 crosses the forest on its western part), and take one of the following exits : from #13 (Cély) to #16 (Nemours). www.autoroutes.fr is a very handy site for planning a trip by car. You could also take the train (stations of Bois-le-Roi or Fontainebleau-Avon) see www.voyages-sncf.com for timetables. There's a train every 30 to 45 minutes departing from the train and subway station of Paris - Gare de Lyon (direction : Melun - Fontainebleau - Montereau - Sens). The journey is about 45 minutes. The station of Bois-le-Roi (5 minutes before Fontainebleau-Avon) might be the most appropriate if you want to boulder in the northern part of the Forêt Domaniale de Fontainebleau, ie Rocher-Canon, Cuvier-Rempart, Bas-Cuvier and Rocher-Saint-germain for elsewhere Fontainebleau-Avon is the best choice. Its possibile to hire bikes in the bike shop in Fontainebleau town. The cost is around 10€ euro a day and is good for those without a car. There are few hills and it saves time on walk ins, beware the wrong/swapped brake levers. 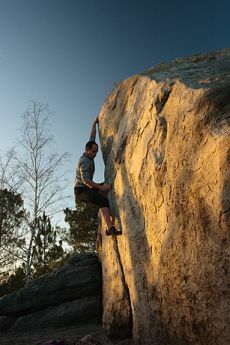 Since going to Font is all about slopers, the conditions are very important. It's possibile to climb there at any time of year, winter is best, in summer it can get very hot in the middle of the day but some good conditions can be found early in the morining and in the evening but don't expect to do anything hard. Easter is a very popular time to visit and is a good compromise weatherwise. Check the forecast on www.meteofrance.com. There is a large range of guide and the most suitable one depends on whether you are intested in circuits or individual problems and how hard you climb. Escalade à Bleau, Tome 2 : Forêt domaniale de Fontainebleau, by the Cosiroc, 2001. 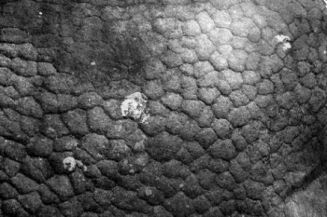 Covers Cuvier, Franchard, Apremont, Rocher Canon and has some interesting general information. Jardins secrets, l'autre Bleau by Philippe Le Denmat and Emmanuel Ratouis, 1997. remote circuits created in the early 90's, often difficult. 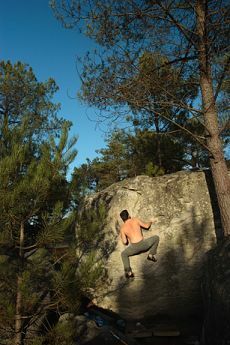 7+8, by Bart Van Raaij's, 1115 straight ups in Fontainebleau. Beautiful minimalist design. The definitive map is IGN map number IGN - 2417 OT au 1:25000 "Forêt de Fontainebleau". There are two approachs to the boulders in Font, either to go and do complete circuits or to work specific problems most people do a mixture of the two. Self control is nessacary early on is a trip as it is very easy to go mad on the first day and spent the rest of the time recovering. One thing is sure by the time you leave your elbows will hurt, this is from pushing down on slopes - I liken it to being at a seance and trying to stop the table hovering. Do loads of press ups and practise your top outs before you go. Font uses the Fontainebleau grading system! This the oldest (and best) bouldering grading system in the world. Some people find it inconsisent in the 5/6 area however I think this is often down to not finding the easiest sequence (and being spanners). One of the best things about Font is the circuits. Following an easy circuit is a great way to get accustomed to the style of climbing at the start of a trip and a good for getting some mileage done at the end. The circuits are graded by color with white being both the hardest and the easiest. Pof (a sticky dried pine resin contained in a cloth) is commonly used in Font especially by the older locals. 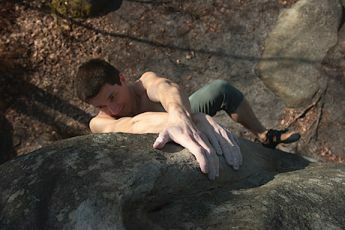 It is very bad for the rock and if used once on a hold the next person is at a disadvantage unless they use it too. A vicious circle. Remember that outside Font the use of Pof is almost universally frowned upon. You will need them! The Chateau in Fontainebleau town, Disney land and sightseeing in Paris are good options. 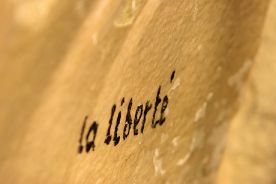 www.gitesdefrance.com Gites are self catering accomadation. Can work out very cheap especially for large groups. Be careful that they will try and keep your deposit. Can be booked for weekends or Saturday to Saturday. There used to be a few free campsites in the forest, the one at Cuvier was especially well known, however they have all been closed down. "Camping de la Musardière", 91490 Milly-la-Forêt, tel+33 (0)1 64 98 91 91 Has a swimming pool (don't forget your speedos). Within walking distance of some of the Trois Pignons areas. Very popular. "Camping du Petit Barbeau", on the river Seine, 77920 Samois-sur-Seine, tel +33/1.64.24.63.45. "Camping municipal" on the river Seine, 77190 Dammarie-les-Lys, tel +33/1.64.39.07.23. "Camping de La Belle Etoile", 77000 Melun-la-Rochette, tel +33/1.64.39.48.12. "Camping Le Lido", Veneux-les-Sablons, 77250 Moret-sur-Loing, tel +33/1.60.70.46.05. Formula 1 is only €24 for a room for three so its as cheap as camping. However the hotel is out of the way from the boulders so you would need a car. Erap is just up the road from the Font/Avon SNCF station and next to the Champion Supermarche. It is apparently one class up from a Forumula1 and just below an Ibis. Its costs 34€ per night for up to 3 people. There are too many areas in Font (more than 40) to go into details of each here, read the guidebook before you go, get recommendations from your mates and take into account the weather/shade/wind. There is a massive Carrefour near Cuvier. There is a supermarche near Milly which is about 40 mins walk from La Musardière. The Soescalade van can be found every week-end at the Trois Pignons carpark. They resole shoes and sell cheap holds and chalk. If you have any feedback or corrections please get in touch via the contact page.